These burgers are in a class of their own, unlike any other vegan burger you’ve tried! 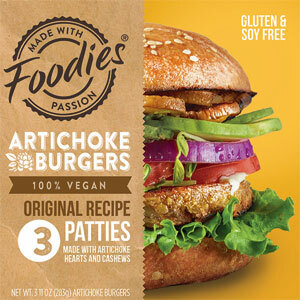 Filled with the rich taste of artichoke hearts and cashews combined with wholesome brown rice, these meat-free patties are packed with protein and are gluten-free, too! Each 7.5oz. (213g) package contains 3 burgers. $5.99 per package. From Anonymous of Summit, New Jersey on 4/4/2019 . These used to be my absolute favorite veggie burgers. Then they stopped selling them in my state. I guess NJ is too far away to ship them, even though Long Island apparently isn't. From Laura Maring of Columbia, Missouri on 3/11/2019 . These are one of my new favs because of the quality ingredients and gf and I LOVE artichokes! I do cook these longer than they say to, typically in the oven for about 7-8 min per side. They get a little crispier but I do kinda like the mushiness of the artichokes actually. I took off one start because they’d be perfect with a little more protein per serving, maybe by adding more cashews. They just don’t fill me up much. From Judi of San Francisco, California on 3/6/2019 . These are mushy and way too sweet. I checked the ingredients and there is sugar! Who puts sugar in an artichoke burger? Yuck. From Nadine of Uniontown, Pennsylvania on 5/10/2018 . I tried these and found them to be very mushy. I made the burger in the pan as directed but it just fell apart. The flavor was good, but the texture was disappointing. From OK of Milwaukee, Wisconsin on 3/24/2018 . I had the French Herb burger and I didn't like it at all - the cashews give it a weird taste. It tasted sweet and just weird overall. There are much better vegan burgers out there!